BELLE VUE OCÉAN OCÉAN ET GOLF. VILLA AU MEILLEUR ÉTAGE MEUBLÉ! Ce est une chambre, deux salles de bain unité joliment meublées avec peut-être la meilleure vue sur l'océan Grand Champions Villas. Les meubles ont un thème d'île. La véranda est un endroit idéal pour prendre votre café du matin tout en profitant de la vue sur l'océan, ou pour voir le coucher du soleil, regarder les golfeurs à venir le fairway ou tout simplement un salon dans la vie privée tout en profitant de la brise tropicale. Cette unité a été modernisée avec des comptoirs en granit, du mobilier design, de nouvelles armoires de cuisine et de salle de bain, une douche surdimensionnée, de la peinture fraîche et de nouveaux draps. Cette villa dispose d'une cuisine entièrement équipée, salle à manger, les plafonds et les ventilateurs de plafond, deux salles de bains et Internet sans fil voûtés. Grand Champions Villas a luxuriante, un paysage magnifique, et les équipements incluent des barbecues, des jacuzzis, deux piscines, et la sécurité. Cette unité joliment aménagées trouve à côté de la verdure de la 2ème fairway du parcours bleu Wailea. Séjourner au Grand Champions vous permet de recevoir des taux d'actualisation pour le golf et le tennis. Vous n'êtes qu'à quelques minutes de restaurants primés tels que Tommy Bahamas, Ruth's Chris Steak House, Longhi’s et Monkeypod. Vous êtes à deux minutes de The Shops at Wailea, qui abrite des restaurants de classe mondiale et des commerces. Cinq parcours de golf sont à moins de dix minutes de route et quelques-unes des plus belles plages sont à seulement quelques minutes. Profitez station vivant à son meilleur. Quels que soient vos besoins de vacances sont, vous apprécierez votre séjour et ramener à la maison des souvenirs qui dureront pour toujours. Renseignez-vous sur des réductions sur des séjours prolongés. Wailea is an absolute beautiful area in Maui. This Grand Champions rental (#86) was superb, clean and comfortable. There were quite a few beaches nearby which were some of the best I’ve been to on Maui. We loved Polo Beach. The photos of this unit do not do it justice; upon entering the condo on the first day I was impressed. The ocean view is fantastic (second/top floor). 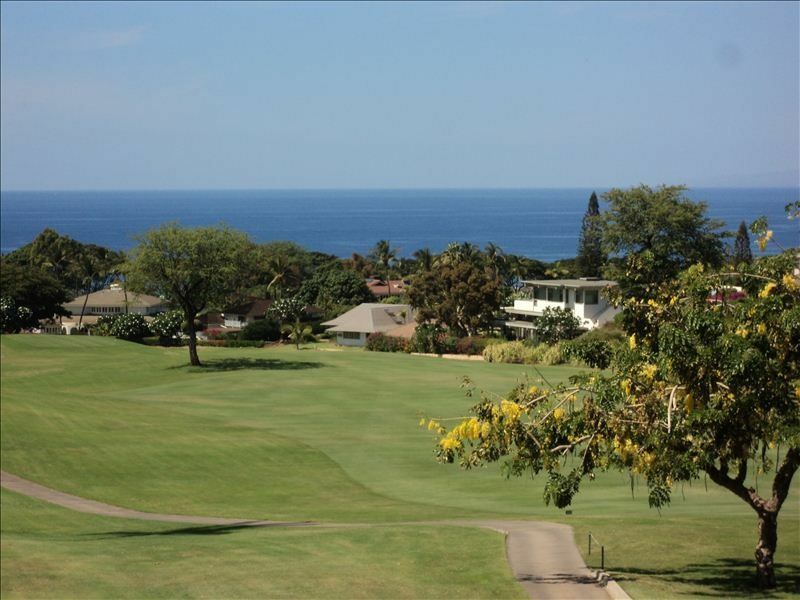 We ate breakfast on the lanai everyday watching the golfers and enjoying the view; then we would sit out with a beverage each evening watching the sunsets before heading out to dinner. There are a few places to eat or grab a coffee within walking distance; the Shops of Wailea are maybe a 10-15 minute walk. Kihei is a very short drive away and we love the beaches there and the laid back atmosphere of that area. We come to Maui every year for a month. Always a fun time. We have stayed in this condo 3 times. Great location, quite, wonderful view, and clean. The owner is also great to work with. This was more than PERFECT!!!!!!!! We have stayed in Maui a few times before, and in this same area, but we have never stayed in a more beautiful, well maintained, and very clean place as this. The condo was spotless. My wife Anne has back issues and the first thing she looks for in a review is comments on the beds. The king sized bed was extremely comfortable! Everything about this condo was comfortable. We were here for my great nieces wedding on the beach. The golf clubs stayed home this trip, but with the balcony looking down at the green, I felt as if I were playing all day long, everyday. The sunsets over the ocean were spectacular, and the moon sets each night were just as spectacular. Anne and I are going through next years calander to see when we are coming back. Art, thanks so much, this is truly a perfect place to stay. This was our fourth stay at the Grand Champions Villa. This unit is the best that we've rented. Our favorite was the view of the fairway with the ocean in the background. We looked forward to eating our breakfast every morning on the lanai while watching the golfers come up the fairway and putting out on the challenging green. Watching the beautiful sunset over the ocean while eating our dinner was priceless. The unit is very clean with a comfortable bed and sofa. The kitchen is well stocked with everything we needed. Everything is in good working condition and really appreciated the 2 window air conditioners which cooled down the unit in the evenings perfectly. The unit is in a nice quiet location. Maui Rental Group was very easy to work with. Thank you Art for sharing your home with us. Hoping to return next year! We have now stayed in this condo twice. The second stay was just as great as the first. The owner and Maui Rental Group are so easy to work with! The condo is perfectly located and has a fabulous view. It's MUCH more beautiful in person. We will definitely be back! This is a no smoking unit. 2 people maximum. Check in time-3 PM. Check out time-11:00.